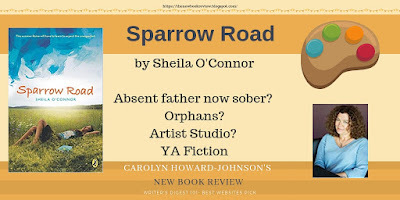 I just read Sparrow Road because I found the cover to be intriguing. Really! And the college on the cover is integral of this story about a twelve-year-old girl's summer before seventh grade, which is not what first might come to mind! Raine has spent 12 years happily living with her mother and grandfather in Milwaukee. Her mother suddenly moves to Sparrow Road in the country for the summer, taking Raine along, and a mystery begins. It is fairly easy for an adult to read between the lines and figure out some of what is going to happen, although at the beginning the rules at Sparrow Road seem like some strange or harsh events will occur. Questions asked through the text of the book help keep the attention of young readers. How many things a twelve-year-old understands about the world is also revealed in this complex story. It seems at first that Raine's mother is quitting her job in the city to be a maid at an artist's summer retreat, where little talking is allowed. Sparrow Road used to be an orphanage. Later, the plot thickens and the reader learns that Sparrow Road is near to where Raine's absent father lives. He has been sober for a year. He wants to meet Raine. Although the plot is a little dark about his past drinking, Raine, and all the artists who have become her pseudo-parents, work through it without too much ado. Raine and her father have a few meetings and begin to get to know each other while a plot about the former orphans who lived at Sparrow Road evolves. The questions the orphans who used to live at Sparrow Road might have parallel the questions a child with a missing parent would ask, and so the theme of wondering about those kinds of things is predominant in the book. Raine is offered the choice to stay at Sparrow Road where she could live near her father, but not near the grandfather who has been a real parent to her or return to Milwaukee. This seems like too much of a choice to offer a child, but Raine decides to return to her former life with her grandfather, mother, and school friends. Her father will be visiting her in Milwaukee in the near future. This story would be fine for children who are not in the position of wondering where their missing parents are, and who do not have difficult life stories themselves. It is a good story and it has a satisfying ending. However, there are children who do not have happy endings in their own lives, so the book isn't for everyone. The book is good for helping children develop some empathy for single parent families or children who have experienced being an orphan. It is just a good read!